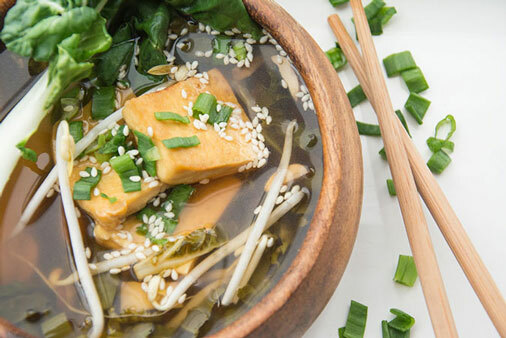 There is no day of the week this Sweet n’ Sour Tofu Soup isn’t a good day for. It’s packed full of so many flavours, lots of vegetables, and can be made ahead of time. We love packing a jar of this soup for lunch, but it’s also a super easy dinner to whip together. We could eat it every day. Our soup may be pretty when it’s finished, but the ingredients on their own are beautiful too! They’re super diverse, easy to find, and are so tasty. There’s nothing more soothing than chowing down on a hearty soup. 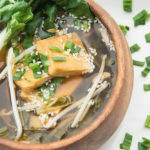 Because this Sweet n’ Sour Tofu Soup has fresh veggies it has a great crunch, but the mix of chili paste and broth gives a nice balance of savoury and sour. If you can’t handle heat, feel free to cut back on the chili paste, but we think it adds a fun element to the meal. Needless to say, we’re obsessed. Looking for more tofu recipes? 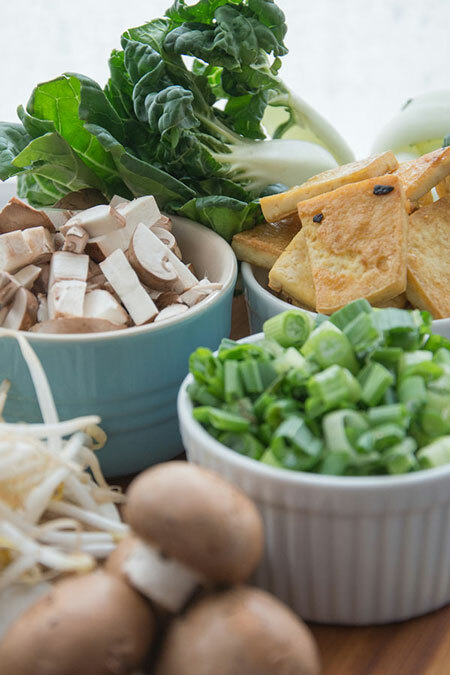 Keep in the same family and try making some Vegan Ramen Bowls, or try tofu a new way like with our Popcorn Tofu! Heat sesame oil in a pan, and cook tofu until both sides are browned and crispy. Approximately 10 minutes - 5 minutes per side or until crispy - and set aside. In a large soup pot, add mushrooms, green onion, rice vinegar, soy, garlic, chili paste, veg stock, bok choy, and water to a pot and bring to a boil. Reduce to simmer and add tofu and bean sprouts. Cook for additional 2-3 minutes. If you like your soup more liquid-y, add extra water.